Show of hands- how many of you became enamored with Justine Cushing's Manhattan apartment while reading the May issue of House Beautiful? I know that I certainly did. At the time of this post's writing, I had read the article three times, and I suspect that I will have looked through it at least once more by the time this post has published. While reading the HB article, the word "refreshing" kept popping into my head. Cushing's apartment is refreshing not in the sense that it presents anything new or novel, but rather because its furnishings don't follow any current trends. There are no statement-making interiors here, nor are there furnishings and fabrics which are preening for the camera. Instead, the home seems decorated with its owner's comfort and pleasure solely in mind. Speaking of the home's furnishings, they represent the best of the best of classic design. Bamboo shades, swing-arm lamps, Chinoiserie, a needlepoint rug (done by Cushing herself), and quilts. Equally as striking are Cushing's antiques, some of which have been handed down to her by family, as well as paintings done by her grandfather, Howard Gardiner Cushing. But what might be most impressive is the fact that much of her apartment has remained the same since 1970, when Cushing made this apartment her home. 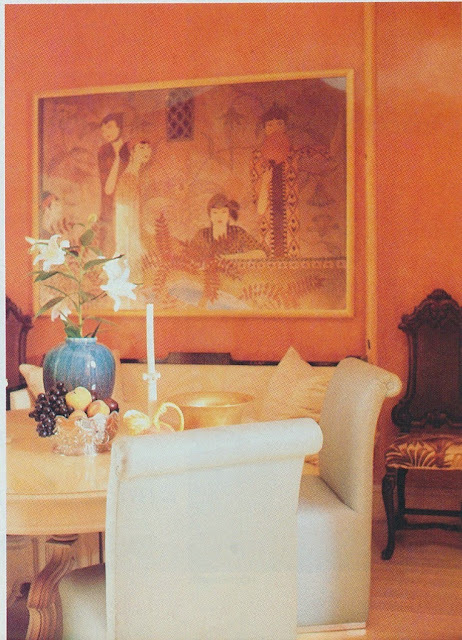 The living room and dining area's orange walls, the living room's furniture arrangement, and the bedroom's wallpaper and canopied bed haven't changed throughout the years. 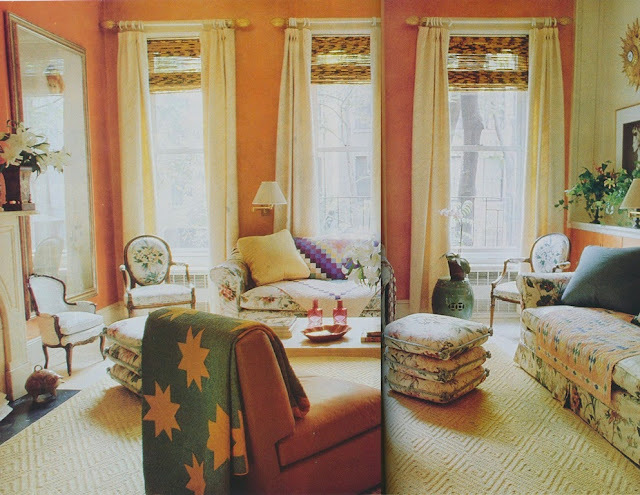 Based on a 1988 HG article about the same apartment (photos are shown below the House Beautiful ones), it seems that only some of the fabrics, accessories, and rugs have been refreshed. 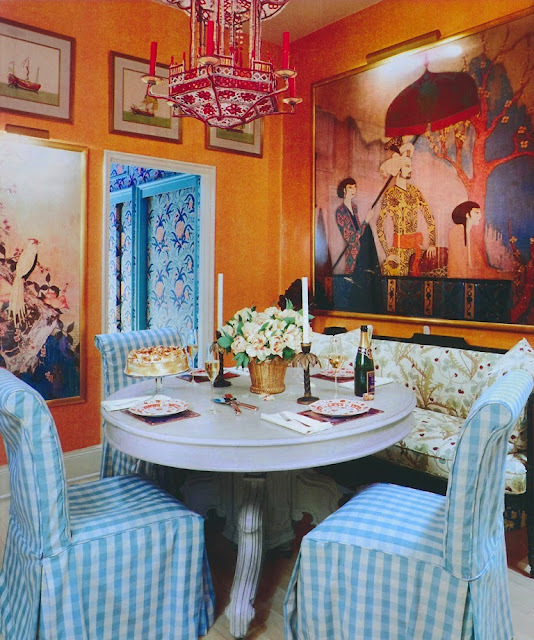 Considering that so many homes are redecorated every few years (or sometimes even rebuilt, as the case is in Atlanta,) don't you find Cushing's sensible approach to decorating to be... refreshing? 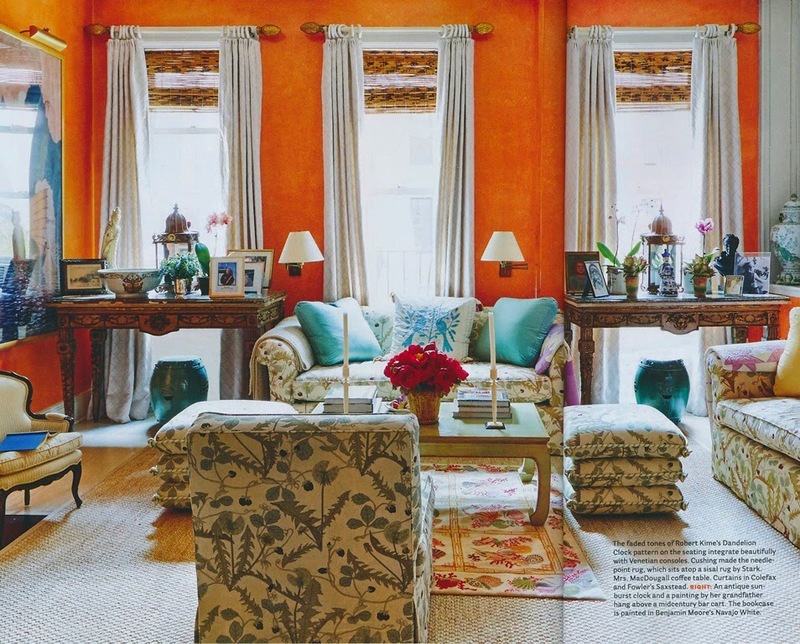 Photos 1-3: House Beautiful, May 2015, Thomas Loof photographer. Photos 4-6: HG, November 1988, Michael Mundy photographer. Yes, I LOVED that her apartment had merely evolved over the years but was never totally redone. 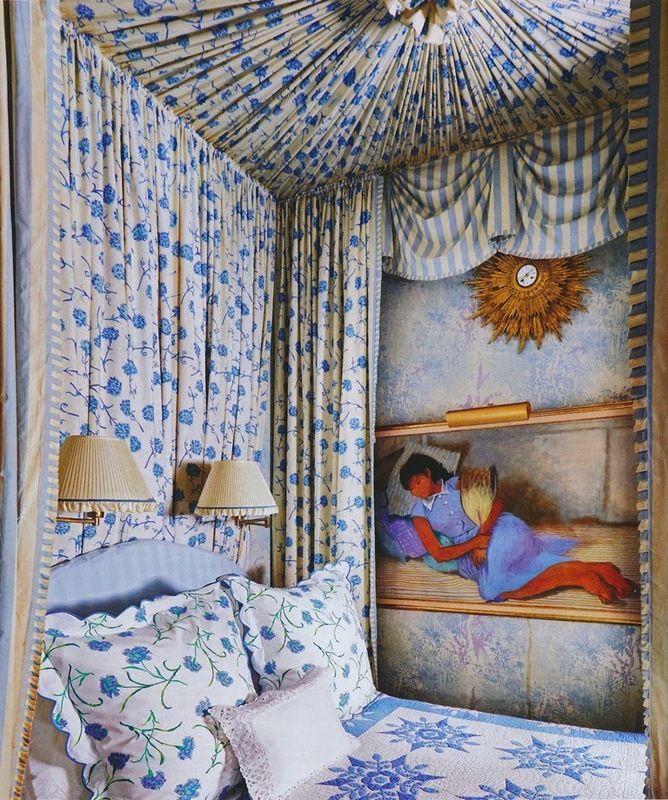 This is what great interior design is all about - a timeless refuge from an increasingly vulgar world. The only "statement" any design should make is "this is my home and uniquely mine". Not, I'm hip/trendy/rich - whatever! It's a great apartment and will still look good for another 40 years. I had always heard that once Jacqueline Kennedy Onassis decorated her NYC apt, it was never changed - just things recovered in the same fabric that she often had specially redone just for her, if it were discontinued. Over the 31 years I've lived in my house, the LR walls have only changed once (25 yrs ago). I have had to have new LR curtains made, and chairs and sofa recovered, but my goal was always to have it look similar enough that if my late husband walked back in the door, he's feel at home and ask what was different, not immediately know! The JKO story is true -- her decorator told me. Lee, on the other hand, was known for re-decorating her homes constantly. 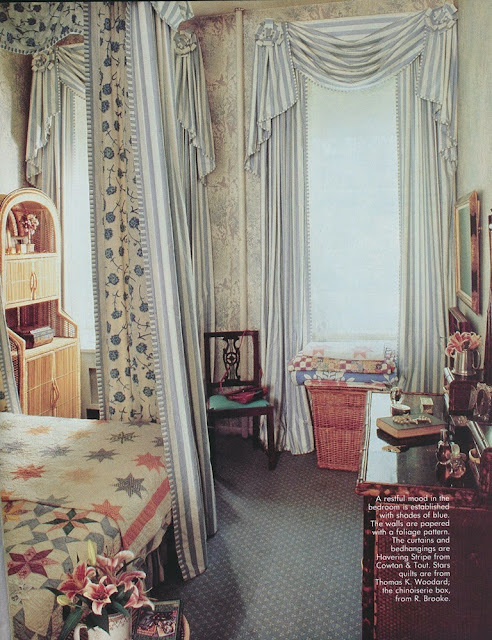 Classic and timeless, I adored this home as soon as I saw these images in House Beautiful! I especially love the dining area with the gingham chairs and settee, and the blue bedroom. Justine has brilliant vision. For many years she has collaborated with Amanda Keep of Woolworks Needlepoint, who has designed the needlepoint rugs for Justine to stitch. Mostly petit-point!